I don’t think twice about eating a hot stew in the summertime. And, as far as I know, millions of Mexicans feel the same way. You will see Pozole served in fondas in the middle of June, hot Caldo de Camarón as one of the most popular items on beach restaurant menus, and the famed Mole de Olla being ladled, sizzling hot from the pot, in markets all over the country at peak midday heat. I’ve read that having something hot in the summer will actually cool you off. It turns out chiles are thought to have the same effect. 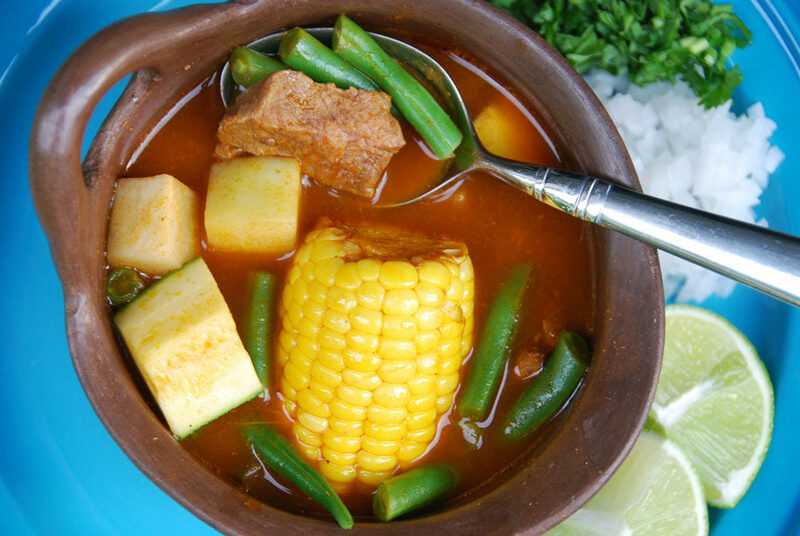 All these Mexican stews, quoted above, have rich broths that are usually flavored with one or more kinds of chiles. I find these kinds of one-pot meals to be the epitome of how practical and creative human beings can be: economical, filling, and so tasty, they have all you need for a meal in a bowl. All cultures have their ways of making stews. In Mexico, Mole de Olla is a dearly loved one, and it is a dish that, unfortunately, hasn’t become popular abroad… yet. Mole de Olla has little to do with the mole sauce so many people outside of Mexico equate with Mole Poblano. That delicious, super thick sauce made of dried chiles, seeds, nuts, spices, tomatoes, onion, garlic, chocolate, and numerous other ingredients ground together. Mole de Olla, however, (translates as Mole in a pot) is a revered stew. As with many of the Mexican stews, the first step for a Mole de Olla is making a broth with the meat, along with some onion, garlic, and herbs. I particularly like to add fresh mint to mine. The meat is cooked until it is practically coming apart, and the broth is as flavorful as can be. The simmered herbs and veggies are removed, as by then they will be extremely mushy and most of their flavor transferred to the broth. The second step is to take that rich-tasting broth to a higher dimension of flavor. A seasoning sauce is made with ancho and pasilla chiles, toasted sesame seeds, and tomatoes. Usually, xoconostles (a very tart and sour fruit of the cactus plant) are used, but since they are quite hard to find in the US, I substitute for tomatillos, which are tart, not as sour as xoconostles, but hey, they do the trick. The meat broth then simmers a second time as it marries with the seasoning sauce, adding so much depth of flavor: a gentle but addicting heat, a lovely acidity, and a whisper of nuttiness. As a third step, fresh veggies are added. Corn, zucchini, chayote squash, green beans…but this time, the veggies are cooked just until tender and crisp and also full of flavor. Mole de Olla is a humble dish. A stew made with a piece of meat and fresh veggies that are available year round. Yet, it turns out to be a full blown delicious meal. As anything Mexican, once it is set on the table and everyone gets a share of succulent meat, a lot of deep-tasting broth, and a share of all the veggies, extra garnishes are set on the table to dress it up and enhance the dish even more. You get a chance to squeeze in fresh lime juice to brighten up the stew, and you also get to spoon on crunchy and pungent white onion and cilantro. This stew is a joy to eat. People eat it almost in a ceremonial fashion. Each person with a set style of their own. Some people eat the corn first, some people leave it for last. Some people first finish the broth and then go for the meat and veggies, or tuck them into tacos. I eat a bit of everything as I move along. But one thing is definite: once I start, I don’t stop for a second, not even to look around. I sip a little broth, take a spoon with some veggies, some meat, more broth, and with my hands I take some bites of the corn… until there is almost absolutely nothing left in the bowl. At this point, I raise the bowl to finish the last sips of broth. Then I wish for another go, just to repeat the experience. Though I always realize I am full, content, and feel so at home. P.S. 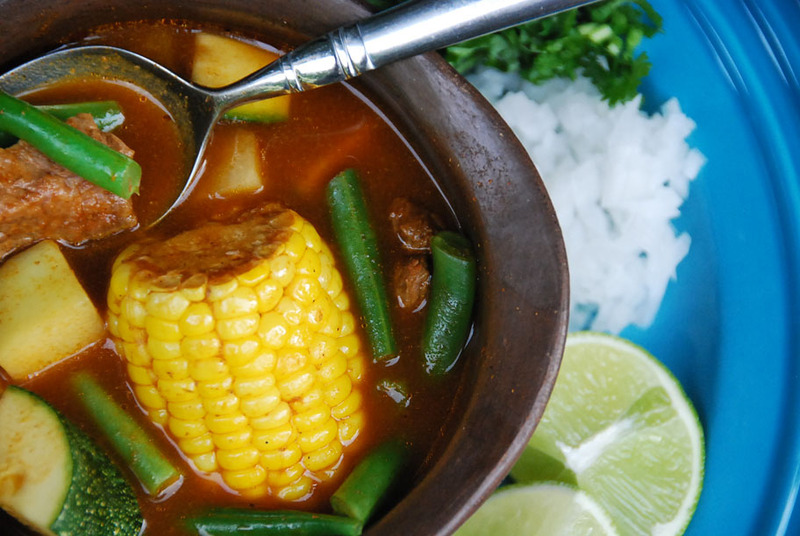 Fall is around the corner, and guess what, Mole de Olla is also fabulous for cold nights. So don’t store this recipe for the summer, keep it out, all year round. In a large heavy-bottomed casserole or pot, place the meat, half onion, garlic cloves, bay leaves, mint and a tablespoon of salt. Cover with 10 cups of water and bring to a rolling boil over medium-high heat. Skim off any foam that rises to the surface, and reduce the heat to low or medium-low heat, cover and simmer for an hour. Meanwhile, place the ancho and pasilla chiles in a medium bowl, cover with boiling water and let them rehydrate for 10 to 15 minutes. Place the tomatoes and tomatillos in baking dish under the broiler, until they are completely charred and mushy, about 10 minutes. In a small skillet set over medium heat, place the sesame seeds and toast, stirring constantly, anywhere from 1 to 2 minutes until they start to become golden brown, but not completely dark brown. In the jar of a blender, place the soaked chiles, along with 1/4 cup of the soaking liquid, the broiled tomatoes and tomatillos, and the toasted sesame seeds, and puree until completely smooth. Remove the lid from the large casserole, remove the cooked onion, mint and garlic cloves (if some remains, it is totally fine) and pour the chile mixture in with the meat. Stir, cover again and cook for another half hour. Remove the lid, raise heat to medium heat, add the cubed chayote squash and the corn, and cook partially covered for 15 minutes. Add the green beans and zucchini, and cook partially covered for another 10 minutes. Taste for salt and add more if need be. Serve in bowls, making sure that each bowl has a serving of meat, corn, chayote, green beans and zucchini. Place white onion, cilantro and halved limes at the table, for people to add as last seasonings and garnishes. Note: Traditionally, this recipe uses xoconostles, which are hard to find in the US. Instead, I use tomatillos, which have a similar tart flavor. Gracias Pati por la receta. Toda la familia encantó! Love your show Pati – its broadcast here in Australia. I was so happy when I found the dried chilis in my continental fruit and veg market and I am trying this recipe tomorrow!!! so excited to task some authentic Mexican comfort food. That’s awesome! I hope you love the mole, Joanna, and good luck! I hope you enjoy it Marie! Just made your fabulous Molé de Olla recipe, Pati! My husband has already declared this a “signature” dish! We love your wonderful program and look forward to many more seasons. Oh thank you so much Bridget! My daughter introduced me to your page. I’m so happy you found me Gloria! Looks great. I want to try a vegetarian version though – any suggestions on how to compensate? I have made this soup a few times; my husband LOVES it!! And the rest of us too of course 🙂 But you really can’t go wrong with a recipe from Pati. Everyone I have tried has been amazing! Thanks for this recipe it looks delicious. Will be trying it soon. I usually use canned salsa del pato but I prefer to use fresh ingredients. Now I can make my own salsa roja. Thank you for trying it, Annette! I made this soup yesterday, and it was absolutely delicious! I added a diced potato and carrots because that’s how I’ve had it restaurants here in the Phoenix area. My sesame seeds had a freshness issue, so I didn’t put them in. The meat was so tender. The veggies were perfection, and the broth was rich and tasty. So many recipes these days called for canned broth or tomatoes or bouillon. It was refreshing to make something so yummy just simple, fresh ingredients. Thank you! I have really been enjoying your PBS TV episodes. I just discovered them this year & tape them all! I was so intrigued with the episode that featured the Mole de Olla that I printed out the recipe, bought the ingredients, and prepared two weeks ago. My husband, my daughter’s family and, of course, I thoroughly enjoyed it! It is such a hardy stew and all the veggies are so wonderful! My Dad used to grow chayote squash. It is used a lot in Cajun/Creole cooking. My Dad was from the Texas Valley and my Mom from New Orleans, LA. And, like you, I have so much fun to mixing cultures. I so love to cook and discover new recipes and foods. BRAVO to you and your family! Thank you, CeCe! I am so happy you like my recipes!! Do u have a recipe for menudo? Hola Erica! I like to serve the mole de olla with something light and refreshing for balance like this recipe: http://patijinich.com/2015/04/boston-lettuce-salad-with-avocado-dressing-candied-pineapple-and-spicy-pumpkin-seeds/ As for the menudo, I will try to post a recipe on the blog soon! I love your show, and have been watching for several years. I just saw this recipe made last night, and it was served up in the most beautiful little black bowl….where can I find more like it? Thank you so much for tuning in!! The bowl comes from a town in Jalisco called Tlaquepaque… we lugged it all the way from there! HOLA!PATY ME ENCANTA LA COMIDA QUE PREPARAR. REALMENTE ME LLEVAS A VOLAR A MI MEXICO LINDO Y QUERIDO. GRACIAS! POR TODAS LAS RECETAS QUE NOS ENSENAS. MI FAVORITA ES “MEXICAN MAC AND CHEESE” ERES FABULOSA. I love watching your show. Where I live in New Mexico, I rarely get any Mexican food (it is not the same as New Mexican). My father is Mexican and I remember the food he use to make for me. Your show gives me the recipes to help duplicate what he used to prepare. I love that you show different parts of Mexico and I long to visit one day. Any suggestions on which city should be my families first visit? Not too touristy but safe. Hola Teresa! Thank you for your lovely comment! Maybe you should head to the Yucatan Peninsula first? Visit Merida, and a beach along the Riviera Maya. I’m very excited to watch Season four. As I watch your show I’ve been reminiscing on all my childhood favorite foods. I have vivid memories of my early childhood years living in Guanajuato. I was born in the city of Salamanca and moved to the states with my parents at the age of 9. I love your show and watch it whenever I can. Even my husband and son will pause whatever they are doing to watch the show. I enjoy cooking because I love to eat great food and also because I love to watch my family eat something nutritious and delicious. Watching the family enjoy a healthy and delicious meal comes with great satisfaction. Its more of a sense of accomplishment on a deeper level. Just watching everybody enjoy what I have created & not expecting anything in return. Doing it just because its in my heart to do so. I love how you make mexican cooking look so easy. Your recipes are very simple and easy to follow. Mole De Olla with xoconostle was one of my mom’s great dishes. (FYI …xoconostle is widely found at any mexican grocery store in Orange County, California.) I remember as a child the xoconostle cactus used to grow wild everywhere in Salamanca, GTO. And if you are a fan of the prickly fruit its delicious with plain beans. Oh and how can we forget esquites, churros, panes, cajeta, charamuscas…..you name it and it all comes with a great warm beautiful memory of my birthplace. Season four has made me reconnect with my inner child. I will be trying the cinnamon rolls with cajeta next, they look wonderful. I saw your show for the first time and my kids and I love it! We have been watching it since like 6pm and it is still on. I am enjoying it so much and want to go to the store and buy the ingredients most common to begin cooking some of your recipes. Oh this makes me so happy, thanks Johana! d your episode on making the Mole de Olla and we immediately knew what we were having for dinner. You just have a gift for describing the interplay of flavors and textures. We live in Texas and we went to our local Fiesta store. while shopping I found spiny chayote squash and of all things a bin full of xoconostles!! So I bought them, but, how many do I use and any special cleaning or prep? Ive eaten tunas but never used in a stew. Also any easy way for peeling spiny chayote. Thank you Laura, I got that in Oaxaca! se ve riquisimo y ando buscando comida saludable llena de verduras,espero me quede tan rico como tu receta. Hice Mole de Oalla esta noche y fue fabuloso! Es un plato sencillo, pero con muchos niveles de sabor. Me encantó el poco de picante, el sabor de los chiles y de las semillas. El maíz era tan sabrosa, y la carne tan tierno y delicioso! Gracias por otra receta maravillosa. mucho gracias Pati, i love to try new receipes. When you said xonocostles come from cactus, I’m thinking the red delicious fruit that’s on the nopal. Is it something like that? what if i already have mole cooked can i just add meat and broth with vegs, would it cime out the same? That would work out PERFECTLY. Hi Pati! I was raised in the States, with strong Mexican influences from my abuelos. To me, this looks a lot like caldo de res. What exactly is the difference? Also, is this a difference you’d come across further into Mexico? As a sidenote, your recipes are where I turn when I get homesick. Thanks for giving a latina college student thousands of miles from home something that looks and tastes like home! With much pleasure Lisa. Yes! Similar to Caldo de res, but Mole de Olla has xonocostles (in my case I add tomatillos) and other ingredients in the flavoring sauce. Cousins, I guess! Preparing your recipe takes me back to my mothers kitchen. My late mothers sopa de fideo is my all time favorite comfort food. I would love it if you would share your recipe for sopa de fideo. Love your show, really enjoy preparing your easy to follow and yummy recipes. Here you go, Magdalena! Instead of alphabet pasta or little rounds, use vermicelli, thin spaghetti or fideo… Thanks for your message! I know, chile confusion is unfortunate and it tends to happen mainly because they are sold under different and confusing names. You can buy dried Pasillas online, have you given it a try? First, I LOVE your show and your cookbook, Pati’s Mexican Table — everything I have cooked from it has been a big hit with my family. My extremely picky daughter said, “Boy, that Pati Jinich really has it goin’ on!” High praise! One of the recipes in your book, Tortilla and Black Bean Casserole, calls for pasilla chiles. Since I can’t find them in my area, I substituted poblanos, and it was delicious. Someday, when I find pasillas, I’ll be sure to try it that way, too. My mother-in-law used to make this and always used epazote but had a hard time finding it here in the U.S. Is that why you use mint? Does it have a similar taste/effect? I use mint because I love what it does to this stew. But you can also use epazote instead, it depends on the cook… It does taste different. Both variations are fabulous! Dear Pati, thank you for the mole de olla recipe. I have been living in USA since 1980, I have been craving since then. I love your show, I love your camera personality, your recipes are easy to follow. Thank you for bringing me back recipes from the past. 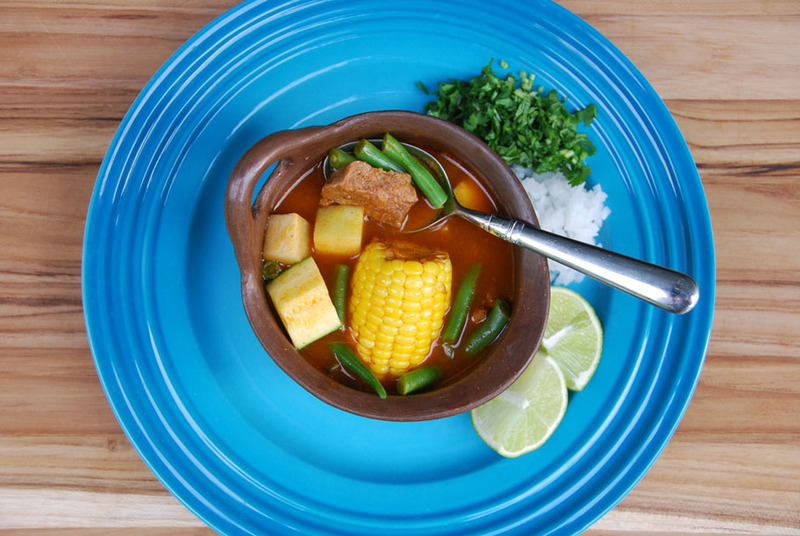 Hola Michelle, So excited to give you the mole de olla recipe…you must like it as much as I do! Thank you for watching the show! !